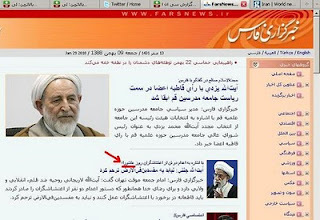 A screen shot from Pro-Ahmadienjad news agency Fars [False] News quoting the medieval monster cleric Ayatollah Janati as saying now that two of the Ashura protesters have been executed no mercy must be shown to the others. The two young men executed on Thursday morning were in fact arrested before Ashura and were in jail during the protests. Another dinosaur cleric, Mola Hassani, called for the bodies of the executed to be dragged in public through the streets to serve as a lesson to other would be protesters. Mola Hassani, the Friday Prayer leader for Oroumiyeh, North West Iran, shopped his own Marxist son which led to his execution in the 80s and refused to go to his own daughter's funeral after she committed suicide.